The steamer Samuel F. Hodge has been discovered in the deep depths off the southern shore of Lake Ontario near Oak Orchard, NY. Steamer Samuel F. Hodge at the dock on River Street in Clevland, Ohio across from J. W. Grover & Son, ship chandlers, sail makers, and riggers. Oak Orchard, New York - The steamer Samuel F. Hodge has been discovered in the deep depths off the southern shore of Lake Ontario near Oak Orchard, NY. Shipwreck explorers, Jim Kennard and Dan Scoville, located the old steamer utilizing high resolution side scanning sonar equipment. In the early morning hours of July 5, 1896, the steamer Samuel F. Hodge of Buffalo, NY caught fire in the middle of Lake Ontario. The Hodge was enroute from Cleveland, Ohio to Prescott, Ontario with a cargo of 600 tons of iron wire. When the ship was off Oak Orchard a fire broke out near the boiler and then quickly spread inside the steamer. Soon the flames could be seen coming from around the smokestack. Within a few minutes the boiler house and after cabin were engulfed in flames. A brisk wind continued to fan the flames. The ship’s crew was forced to take to the yawl boat. One man had to jump through a window and into the lake to save himself. A passing steamer, St. Joseph, sighted the burning steamer and came to the Hodge to offer assistance to the crew. For over an hour they sprayed two streams of water into the burning steamer with hardly any effect on slowing down or stopping the raging fire. The St Joseph soon became badly blistered by the intense heat from the fire. In 2007, while Kennard and Scoville were searching for the schooner Milan, their sonar displayed the image of a large hull of a shipwreck. This was clearly not the schooner that they had been looking for but another unknown vessel. The hull was found in a depth of several hundred feet of water which is well beyond the safe diving limits (135ft) of recreational SCUBA divers. For this reason the shipwreck explorers were unable to view their discovery that season. Within the past year the team deployed an underwater Remote Operated Vehicle (ROV) developed by Scoville to explore the hull of the shipwreck that they had discovered. 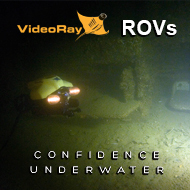 To view the sunken remains of the shipwreck, the ROV with on-board cameras and high intensity lighting was deployed to bring back images of the shipwreck. On the day that the ROV was sent down to explore the shipwreck the visibility was exceptional. Some natural light from the surface provided enough illumination to allow the low light cameras to view objects on the shipwreck at a greater distance than with the ROV lights. The shipwreck was found to be upright on the bottom. The ribs of the side of the ship protrude high above the hull on both side of the ship. Much of the ship’s forward and mid deck are covered over by silt. Some of the openings to the holds in these areas are just visible. A large steam engine extends up above the hull of the ship. At the stern a single propeller and rudder are almost completely exposed.A close up view of the shipwreck showed that this ship had been burned down to the water line. The upper deck and cabins are completely missing as are any of the masts that may have been part of the vessel at one time. During another sonar search later on, the shipwreck explorers found the masts of the steamer several miles away. The masts had fallen off the ship as it burned and drifted towards its final resting place off Oak Orchard. The nameplate for the steamer could not be found within the burnt remains of the ship, so other characteristics had to be utilized to make an identification of the shipwreck. 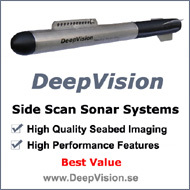 Measurements made by the sonar equipment indicated that the length of the ship was approximately 150 ft and its width 30 ft. The shipwreck was a steamer with one propeller that had burned somewhere out in the lake off of the town of Oak Orchard. A search of several shipwreck databases provided only one possible candidate that exactly matched the ship measurements and was lost by fire in that area of Lake Ontario. It was the steamer Samuel F. Hodge. The Hodge was built in Detroit in1881 and was classed as a steam barge. The ship was owned by the Farrell Brothers of Buffalo, NY. All of the crew was saved from the burning ship by the Steamer St Joseph, except for the fireman who was most likely cremated in the fire. Jim Kennard has been diving and exploring the lakes in the northeast since 1970. He found over 200 shipwrecks in the Great Lakes, Lake Champlain, NY Finger Lakes and in the Mississippi and Ohio Rivers over the past 35 years. Using his background as an electrical engineer, he built the side scan sonar system that located many of these shipwrecks. In 1983 he discovered a unique horse powered ferryboat in Lake Champlain. National Geographic featured the ferryboat in their October 1989 issue. Several other of his shipwreck discoveries have been reported in various publications including Skin Diver, Wreck Diver, Inland Seas, and Sea Technology. Dan Scoville is an experienced cave and "technical" diver who utilizes custom gas mixtures of oxygen, helium, and nitrogen to dive to depths of over 300 feet. In 2005, Dan led the development of an Underwater Remote Operated Vehicle with a team of college seniors from the Rochester Institute of Technology. Since then he has used his ROV to explore shipwrecks in Lake Ontario and to locate the bodies of three hunters from a lost Seabee Republic aircraft in Lac Simon, Quebec. He is currently a project manager and electrical engineer for Oceaneering International located in Houston, Texas. 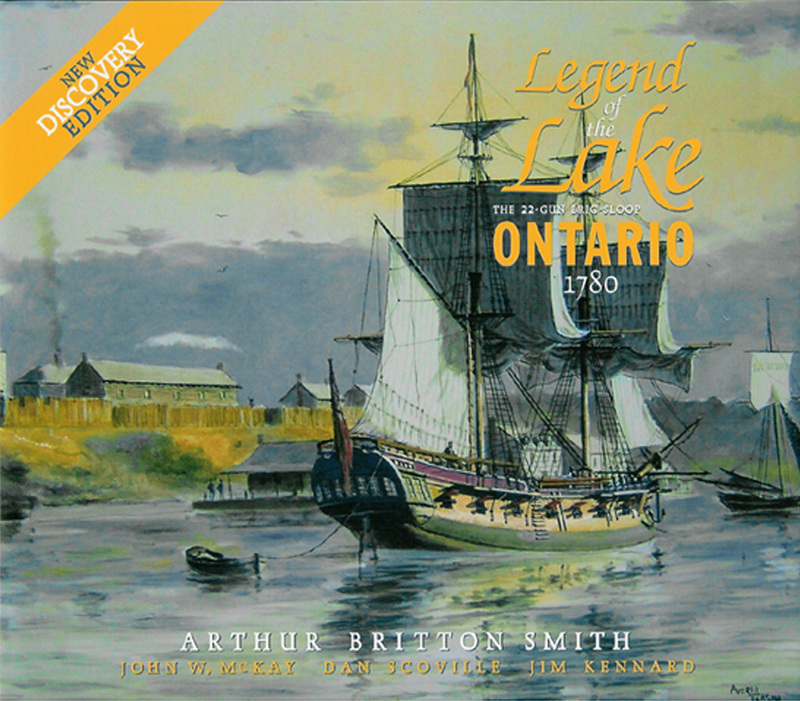 In May 2008 Kennard and Scoville discovered the British warship HMS Ontario, the oldest shipwreck ever found in the Great Lakes, and in September 2008, a rare 200 year old “dagger-board” schooner, both of which received worldwide attention in the news. Roland (Chip) Stevens is a retired architect and working artist whose artwork is well known in the Rochester area and which has been accepted into numerous national exhibitions. A sailor for many years, Stevens has a love of the sea, as reflected in his seascape watercolor paintings. He has created paintings of the some of the recently discovered Lake Ontario shipwrecks that have appeared in various news stories and publications. Does anyone know where the photo was taken of the Samuel F. Hodge at dock ? I answered my on question buy searching the company name. If anyone else is interested, here is a brief excerpt and a link to the site where I found the information. J. W. Grover & Son, ship chandlers, sail makers, and riggers, 117 and 119 River street, Cleveland, Ohio, is one of the oldest firms in their line of business in the entire chain of lakes. Established 1869. Original Name: Samuel F. Hodge. Final Disposition: Burned at Lake Ontario on July 5, 1896. Does anyone know what artifacts have been recovered? My family attended a talk you gave last year in Pultneyville,and my son has been waiting for the show that was supposed to be on T.V. Did we miss it?We thought it was to be shown on Oct 31? Hi, The documentary on the British warship HMS Ontario is currently underway and we expect that it will be aired in the Fall of 2010. Stay tuned.